Our 2015 Officers are: Jean Arehart, President; Jocelyn Busby, Vice President; Liz Crites, Recording Secretary; Emily Cantor, Corresponding Secretary and Dana Maury, Treasurer. The Rev'd Dorothy Sanders Wells is our chaplain. 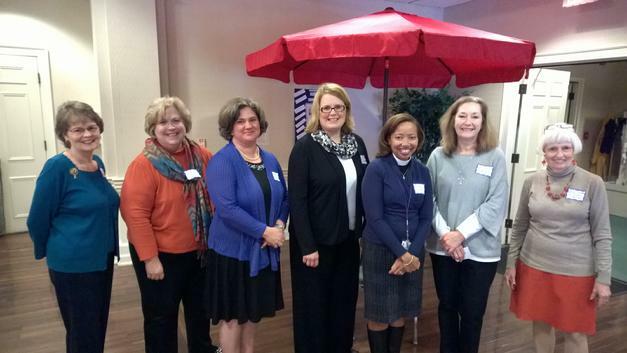 The 2014 Officers were: Jean Arehart, President; Jocelyn Busby, Vice President; Liz Crites, Secretary; Jeanette Maddox, Treasurer and The Rev'd Dorothy Sanders Wells, Chaplain. You may contact Jean Arehart at jeanarehart (AT)gmail.com or 901-756-6460. The 2012 officers for the Episcopal Church Women of the Diocese of West Tennessee were l. to r., Pat Geelan, Program Chair; Evelyn Piety, President; Linda Miller, Treasurer; Dorothy Wells, Chaplain. Not pictured: Laurie Monypeny, Corresponding Secretary. The 2011 Officers were: President, Agnes Gordon (St. John's); Recording Secretary, Carolyn Murray (St. John's); Corresponding Secretary, Laurie Monypeny (Calvary); Treasurer, Merrill Ann Cole (Calvary) and Program Chairman, Pat Geelan (St. Mary's Cathedral). 2010 Officers were: President, Agnes Gordon (St. John's); Recording Secretary, Beth Campbell (St. John’s); Corresponding Secretary, Judy Phillips (Annunciation); Treasurer, Gayle Hardee (Holy Communion), and Program Chairman, Pat Geelan (St. Mary’s Cathedral).